By the early 2000s the area’s large stock of substantial rowhouses on tree-lined streets began attracting an ethnically diverse population of Afro-Caribbeans and foreign-born people, as well as gentrifying whites. According to the American Community survey in 2013, the population was 56% Black, 22% White, 19% Latinx, and 2% Asian. Neighborhood residents maintain many beds at the Hattie Carthan Community Garden. Perhaps this eclectic and cosmopolitan population base explains the look and feel of Bed-Stuy’s Hattie Carthan Community Garden and Farmer’s Market when I visited in October. The Community Garden is on the end of a block of brownstones and contains numerous plots for individual gardens as well as quiet public areas, picnic tables, and stretches of trees. It has been in existence since 1981. The Farmer’s Market, established in 2009, is on a narrow strip of land adjacent to the Garden. It serves as a site for community members to gather, buy and sell food, and take part in educational, spiritual, musical, artistic and cultural programming. Perhaps the two pieces of land represent the needs of the community at the time they were established. 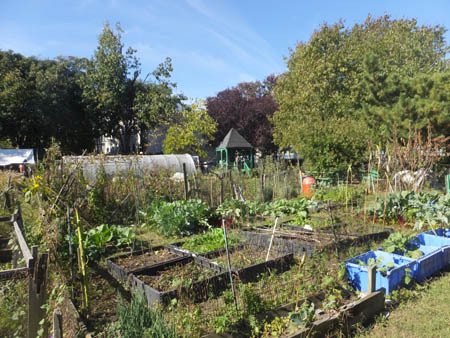 The community garden is like so many other such facilities in densely populated American cities – a site from which private housing had disappeared and which residents, often from rural backgrounds, began using for growing food. Ultimately this activity became so popular that the city, having taken title for non-payment of taxes, allowed it to be formalized for that purpose and supplies such basic necessities as water. The farmer’s market is a much more up-to-date space, once an abandoned lot where trash was dumped, now it is filled with murals, chicken coops, demonstration plantings, free libraries of kids books, composting spaces, display tables, rows of raw and processed produce for sale, live and recorded music, and costumed people. Or perhaps the two spaces have taken on the character of the two strong black women who established them. 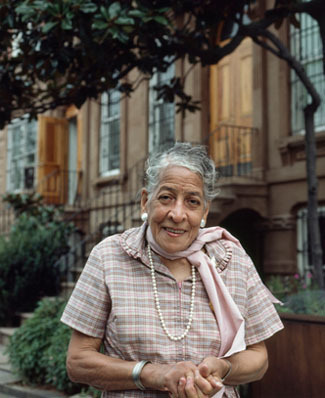 Hattie Carthan (1900 – 1984) was a Bedford-Stuyvesant resident who loved trees. Mrs. Carthan led the charge to preserve a particular Southern magnolia tree, brought on a ship from North Carolina in 1885, that became a symbol of the neighborhood. The tree, rare in the northeast but protected from killing frosts by adjacent buildings and probably heat from the nearby subway, had grown to 40 feet in height. Carthan not only succeeded in having a wall built to protect this tree but also spearheaded the successful attempt to designate it an official city landmark in 1970. Noticing natural conditions in her neighborhood beginning to deteriorate, Mrs. Carthan began replanting trees there. 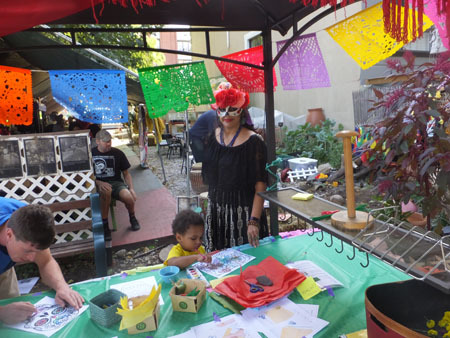 She started the Neighborhood Tree Corps in 1971 as a way to teach young people how to care for trees, and the Green Guerillas, a force behind the resurgence of the community garden movement. The organization began informally in 1974 with tactics as simple as throwing water balloons filled with seeds into abandoned lots; the positive response showed the overwhelming need for more green space in the inner city. 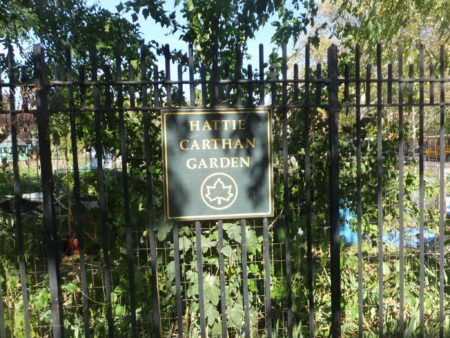 In May 1998, the garden was named in honor of Mrs. Carthan. Yonnette Fleming is another natural community leader. Born in Guyana, she came to the US at 15 years of age. She had grown up living on large family sugar, rice, and coconut plantations, and with a grandmother who still grew food and baked bread. But upon coming to America she got caught up in the dream of success for a time and worked as a financial broker on Wall Street. Since 2003, however, she has been active in urban gardening and farming. Currently vice president of the Hattie Carthan Community Garden farm, she is a raphaologist, ordained minister, plant and sound medicine practitioner, reiki master, healing circle facilitator, and herbal Wysewoman. She teaches a Food Justice course for the Farm School in NYC and is a member of the Farm School’s advisory board, considering herself a ‘social change activist’. When I first met Yonnette she, along with others helping with the market, was wearing a flaming orange and black face mask. • Annual Plant Sale — local gardeners, schools, block associations pickup plants for their gardens. Of course the Community Garden and Market also run many education programs appropriate to raising food in the city. Another practical program centers around the ‘Herban Farm and Apothecary’ that Fleming organized in 2011 on a neglected urban lot nearby. She studied plants and cell medicine for 10 years at the College for Indigenous Medicine and is a fan of their enormous restorative powers. The herbal apothecary is loaded with freshly harvested medicinal herbs, herbal cosmetics and healing products crafted by Yonnette, who offers apothecary healing services such as Chakra rebalancing, energy healing, sound healing, aura cleansing, and reiki sessions. Groups focusing on dietary methods, percussion, plant dreams, sacred design, clearing land trauma, sacred mandelas and labyrinths are also available. A number of young people have been engaged at the sites through Americorps or other programs. They do a variety of jobs, including running educational programs, and have expressed an interest in getting more involved in food and farming. African American-owned farms in the US have been on a historical decline for many years, but Yon would like to counteract that reality by finding ways to make black ownership easier. To this end she has helped create the Farm School, a training program of the Just Food program to promote learning about different kinds of farming and how to get access to land. There is also a tiny tots program, including their own curriculum in the garden in the back in which 2-year olds participate. They have a pizza garden and had a program on smoothies and how you make them. The chickens are there, and a little cow that you can move back and forth to make compost. 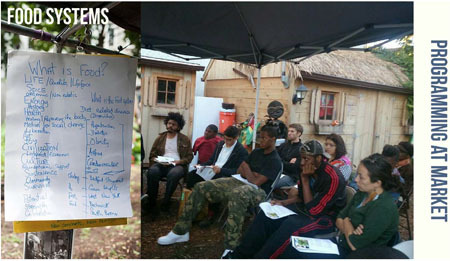 Youthful community members learn about the food system at regular educational sessions. As an example of an educational program, while I was there Jeneé Granum presented a demo on how to make pumpkin fritters drawn from the recipe in Caribbean Vegan, by Taymer Mason. You cut a pumpkin or squash into sections, grate the meat into a bowl, add flour, a tablespoon of brown sugar or agave or honey, corn starch, baking powder, salt, cinnamon and nutmeg. After mixing the dry ingredients together, you add ¼ cup of milk, a teaspoon of vanilla extract, and mix the batter with the pumpkin meat. You pick out a tablespoon of fritter and deep fry or bake it, dust with sugar and then eat. The fritters Jeneé made were delicious! Another delicious product of the Garden is figs. They have about 7 trees, which were producing delicious ripe figs when I visited. Apparently the effect of the subway line warming the soil is adequate to protect the roots and enable this treat to survive Brooklyn’s cold winters. Obviously no activity like this can exist without financial backing. But Yonnette does not take a traditional approach to fund raising. “We generally don’t do a lot of writing for grants from foundations,” she relates. “We don’t want to fit into small boxes and talk about ourselves as lacking or needing. The only money we are interested in is social justice money, for things like food sovereignty work. We have been here for forty years, so everyone has to support it! It takes a village to support the farm and the market! I met a young black woman named Myles, new to the neighborhood as she just arrived four weeks ago, handing out flyers about the November 11th Farmy folks Soiree, which charges $50 for a Hyperlocal, Organic dinner, and $30 for a Wine and ferment bar. She was also promoting a Healing and Volunteer Appreciation Dinner on Nov. 19th. She explained how they try to make the classes self-supporting by charging reasonable fees and making sure people get something for their money. A young white man named Mike Swigert had been in the community for several years. He is particularly interested in the political dimension of the work there. The produce and processed items sold at the farmers market raise some funds, obviously. But most of that is paid for by the market, either to folks who raise it in the Community Garden or to Pennsylvania farmers. “You ask where our food comes from,” explains Yonnette. “Let me tell you how it goes from Friday. I invite community gardeners who could submit a crop plan and have me check their soil to make sure they are not using chemicals, and they can bring food on Fridays. I pay them and sell their food. We have about 8 community gardens that do that for us and we aggregate their food to sell it. Staples of squash, rutabagas, sweet potatoes – we’ll never be able to do those on urban land – those come from Lancaster County in Pennsylvania. The role of African Americans in the Garden, Market, Farm, etc. is important to the members. Even Mike, a white gentrifier, feels this is important. “This over here,” he says, “is a community garden and those are all individuals gardening here. The entirety of the other site (Herban Farm) is maintained as a community project. It is infused with a spiritual energy – it’s an African indigenous, woman-led, people-of-color project. The role of African Americans in the leadership of the Garden, Market and Farm is central to Yonnette. 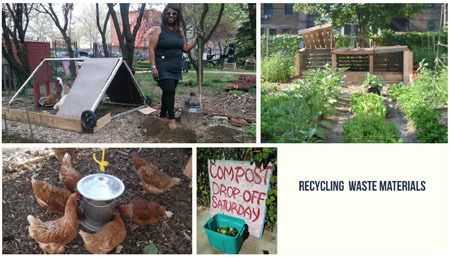 Recycling waste, be it manure, garden clippings, or neighborhood kitchen waste is an fundamental principle for the Garden, as well as an important source of fertility. ‘The project here is an African-American led one,” she asserts. “It always has been for the 40 years it has existed. The older garden ran a kind of sterile narrative about who they were as though all things were equal. They did that for a long time. It’s a traditional community garden where everybody gets a plot. It is like everybody is there, we are all here, there is no racial justice narrative going. But when gentrification came on the community they got to the level that they realized the sterile narrative, although it seems like a friendly thing to do, is not how you cultivate community. We are a diverse community, naturally, and there are various power structures. Everything is different for everyone. So in 2009 we began to clearly say that we are a people-of-color led project. That our work with the youth is on youth of color, to heal and repair themselves. Everything that we do has that sort of narrative. 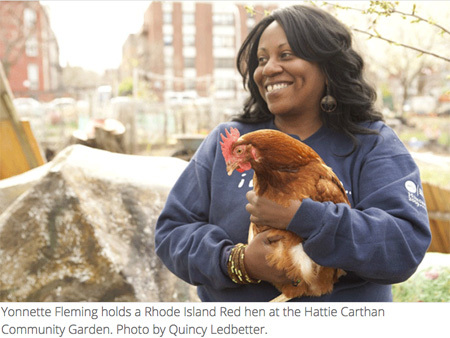 Fleming’s concern with African American control may seem discriminatory to outsiders, but she feels that keeping her community in charge of the Garden they created is vital. To that end, she argues, it is important to stress the strengths and assets of your community, not its weaknesses and needs. Also important to community education about what needs to be done, Yonnette suggests, is a recognition of the problems they face and an appreciation of the traditions they come from. “People need to have a race/class analysis,” she says, “when they are trying to be a part of creating a more equitable and sustainable future. The food system is so bad in so many ways – unhealthy food, people profit from it who are far away from producing it, lots of waste, issues of race and equity… The kinds of classes we run help you understand all that and create alternative ways of farming – local, organic, collective. I asked several people at the Garden/Market/Farm how they would like to see the programs grow in the future. Veronica Crevino, a volunteer staffer, mentioned their desire to function throughout the year. One other consequence of year-round operation would be that the market could attract upstate farmers with winter crops, root vegetables, and preserved food. It would be an opportunity for them to reach a large urban market and a chance for the market to earn significant stall fees. Yon is currently planning on building a classroom and herbal preservation structure on the farm and will be launching an indegogo campaign to raise funds for it. Large teach-ins and herbalism intensive courses are among the programs which would be taught there. Another goal Yon has is to install a solar electrical tree at the farm. Also to have a rainwater barrel system there and a pump to activate it so the water can be brought anywhere for use. 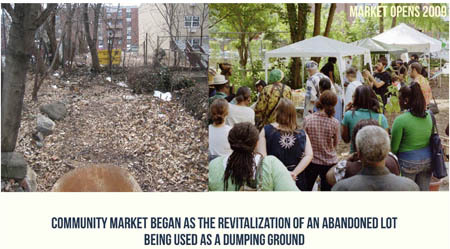 Longer leases – not the 3-year type currently used for the market, but more like the 40 years, which the Community Garden has. That would enable significant investment in the sites. EBT support – the city requires every single community-based market to have an EBT operator. If that could be changed, or a system set up to pay for such an operator, then SNAP benefits and other such programs would be easy to use and the vendors could all function easier. School programs – Yonnette would love not to have to chase down the schools for teacher awareness. The children are already coming to the site for services and teachers would benefit from such exposure themselves.